TAMPA, Fla. — As the sun set behind George M. Steinbrenner Field on Thursday night, the lights atop the eight towers strained to illuminate the baseball game below. The stands, except for a sliver of light that touched the edge of the dugouts, were bathed in darkness. Batters standing in the on-deck circle managed to create shadows. The field itself seemed lit by flashlights with dying batteries. Though the familiar frieze of Yankee Stadium rings this 20-year-old stadium, which is also used for the team’s Class A club, the lights represent just how far it is from the big city. But Headley, like others, was quick to say he was not complaining. Most major leaguers understand that when they come to Florida and Arizona to prepare for the regular season, they will play some games under less than luminous conditions. Playing for the Yankees usually means playing more of them. The Yankees, who have one night game remaining in Florida — at home Tuesday against Detroit — will have played seven night games during spring training, which, along with Atlanta, is the most among baseball’s 30 teams. The Mets will have played two during their time in Florida, while St. Louis and Tampa Bay have no night games. The Yankees have traditionally played more night games than most teams, if not all. This is done, according to a team spokesman, so the Yankees can cater to different clienteles — out-of-towners who are happy to soak up the sun as they watch baseball and local fans who might appreciate the convenience of not having to miss school or work to attend weekday games. Night games are also often preferable for corporate clients. In addition, television networks have shown an increasing interest in night games. ESPN broadcast Thursday’s game along with the Yankees’ YES network, which is broadcasting 15 spring training games, including four of the five home night games. “There’s money to be made, and if the Red Sox or the Yankees have the opportunity to make some extra money by playing at night, they’re entitled to do that,” pitcher Andrew Miller said. Not all fields are lit the same. When the Braves hosted the Yankees on Wednesday, the game started at 6:05 p.m., long before sunset. When the sky finally darkened, midway through the game, the field was illuminated like a big league ballpark. But for teams with older parks, like the Yankees, or the Blue Jays in Dunedin or the Pirates in Bradenton, the lighting is not so good. The Pirates play only one home night game this spring, the Blue Jays none. Playing at night under these conditions can create unusual circumstances. Pitcher Adam Warren said he once had difficulty making out a catcher’s signs. A fielder might get a poor read on a ball, as center fielder Slade Heathcott appeared to do on a line drive hit right at him Thursday night. But mostly batters are affected. 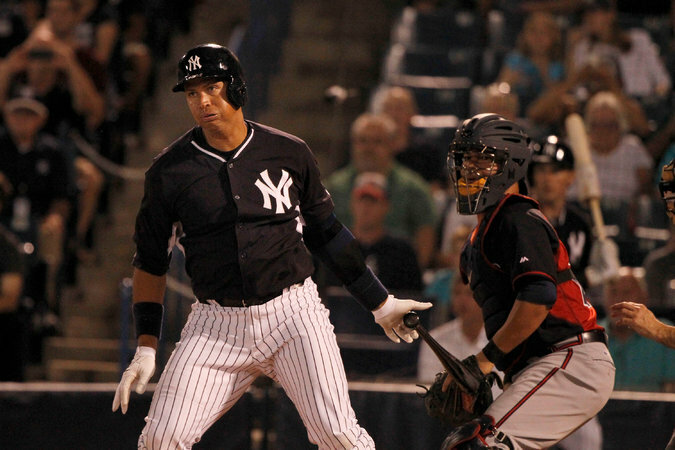 Consider Alex Rodriguez. He is 0 for 10 with three strikeouts in four night games, all at Steinbrenner Field. In his other games, all played during the day, he was 7 for 16 with two home runs and a double through Friday. When Rodriguez struck out in the final at-bat of his first night game this month, on three pitches, he said with a laugh that he had not seen any of the pitches. Few Yankees had any real gripes. They have played in such conditions in the minor leagues, and some, like Warren, said they preferred the excitement of night games despite the poor lighting. Headley said night games helped prepare for the regular-season schedule, which is overwhelmingly filled with night games. “The games don’t count, so there’s not a whole lot of complaining,” said Miller, the reliever. Manager Joe Girardi said the substandard lighting was probably why the Yankees’ home games had tended to be low scoring. Only once in four games has a team scored more than four runs. This is especially good news for Rodriguez, who looked like a different hitter Friday from what he did Thursday night, when he struck out in his last at-bat, flailing at a curveball from Andy Oliver. On Friday, he was ahead in the count, pulled two fastballs that he grounded out on and then hit a mid-90-mile per hour fastball from Rondon just over the right-field wall. This entry was posted in Uncategorized and tagged DimLights, LEds, Stadium, Training, Yankees on April 14, 2015 by lightstoreusa.